How long will it be before you can begin my project? This can depend on the size of your project, design time needed, your town’s permitting process, and ordering time of your selections. How long will my project take to finish, once you begin? Based on what kind of project you have, we will map out a time frame within your contract. We will do our best to maintain this time frame, however, adding on additional work, weather, or other unforeseen circumstances can arise over the course of a project and affect the time frame. Does it matter if I’m on Cape or off Cape for the duration of my project? No. If you are here during the project, we will do our best to accommodate your needs. Many clients, especially for more significant work, are off Cape but we remain in touch with you to let you know of progress, about selections, decisions, etc. Many clients will return to the Cape for an on-site visit. Do I have to worry about permits? No, we will handle the permitting process for you. Depending on the type of permitting needed for your project, this can take anywhere from a few days to six weeks. Per our contract, they are due within five (5) business days. Your bill will be sent to you whichever way you find preferable- postal mail, or email. How much will it cost for a new kitchen? This can vary greatly, depending on what you want to accomplish and how large your space is. The best answer is to consult with one of our designers to get a general idea of what can be done within your budget and what is appropriate for your space. Our designers can visit your home, see the space, talk to you about what you are hoping to accomplish and then give you a much better estimate. If you would like to set up an appointment, click here. What are my options for countertops? There are many different options available for countertops. Granite is currently the most popular material. Marble, quartz, corian, laminate, wood, concrete or recycled materials are all options as well. You can stop into our showroom to see granites, quartz and corian on display and look at many other color samples that we have on hand. A typical bathroom remodel should take about 2-3 weeks. If a glass shower door is included, it may not be installed for another 2 or 3 weeks after the tile is completed. How long will it take to remodel my kitchen and do I have to move out in the meantime? This depends on the amount of construction being done (moving walls, replacing windows, etc.). A simple kitchen remodel without a lot of construction could take as little as 2-3 weeks. Something more complicated would take longer. It can be very helpful to set up a temporary kitchen somewhere out of the work zone. It’s always a good excuse to eat out, too! What if I already have plans from an architect? No problem! While we are a design build firm and would love to work on plans for you, we also are comfortable working with architects and have collaborated with many local architects on beautiful projects. We’re always happy to discuss the work you have in mind. 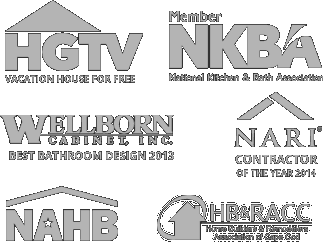 While we do work on smaller projects, if there is one of our trade partners that might be better suited for your project, we may directly refer you to them. Is there a fee for the first appointment with George? No. However, if you enter into our design phase, there is a fee which varies based on the scope of work.